To improve the quality of existing PE teaching through continuing professional learning in PE for generalists, so that all primary pupils improve their health, skills and physical literacy, and have broader exposure to a range of sports. To increase the quality of initial teacher training in PE and sport, and to promote PE specialism in primary level workforce. To understand and value the benefit of high quality PE and sport, including its use as a tool for whole school improvement. 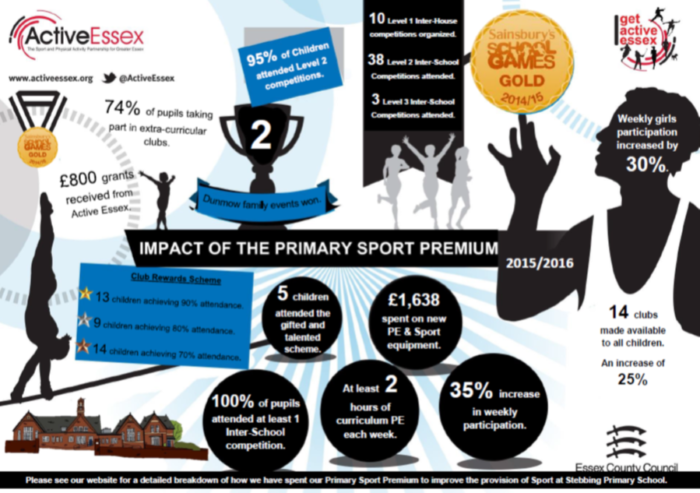 Please see the infographics below for an overview of how the Primary PE and Sport Premium has been used since to improve the provision of PE and sports throughout the school. Please see below a more detailed forecast of how we are planning on spending the PE and Sports Premium grant in 2018/2019 and the impact that we expect it to have on the children at Stebbing Primary School. You will also find previous spending review plans to see how we have used the funding in the past and an evaluation of the impact it has had. © 2019 Copyright Stebbing Primary School.